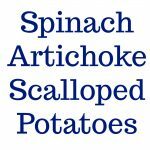 Spinach Artichoke Scalloped Potatoes are a nice side dish to add to your holiday table. 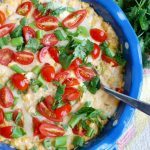 This dish is a twist on your favorite classic scalloped potato recipe using sliced potatoes and mixing them with spinach artichoke dip and topped with shredded cheese. The potatoes are baked until everything is warm and bubbling! Scalloped potatoes remind me of the holidays as a child. Whether it was Thanksgiving or Christmas there were often scalloped potatoes of some kind on the table. These Spinach Artichoke Scalloped Potatoes are a new twist on classic scalloped potatoes. 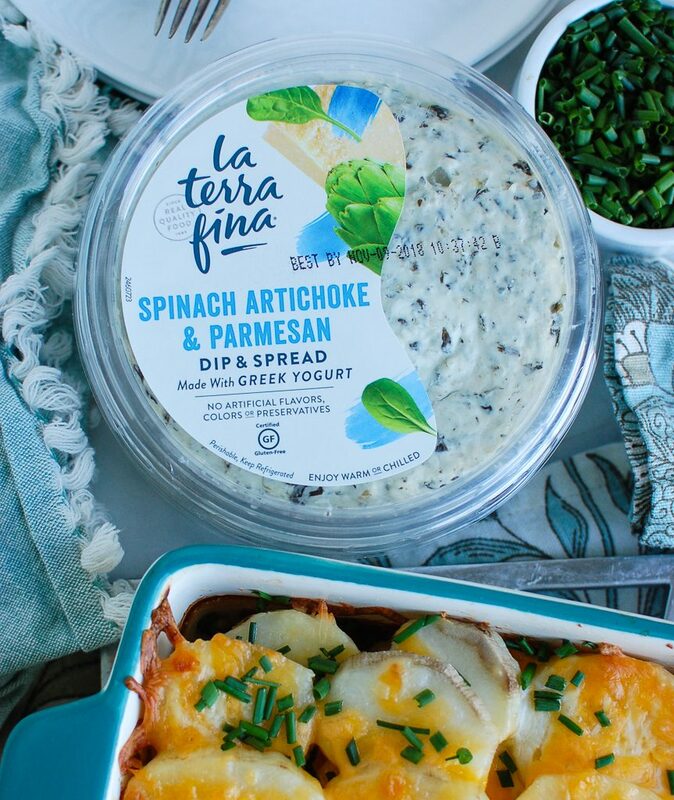 They use La Terra Fina’s Spinach Artichoke & Parmesan Greek Yogurt Dip as a layer in the scalloped potatoes. 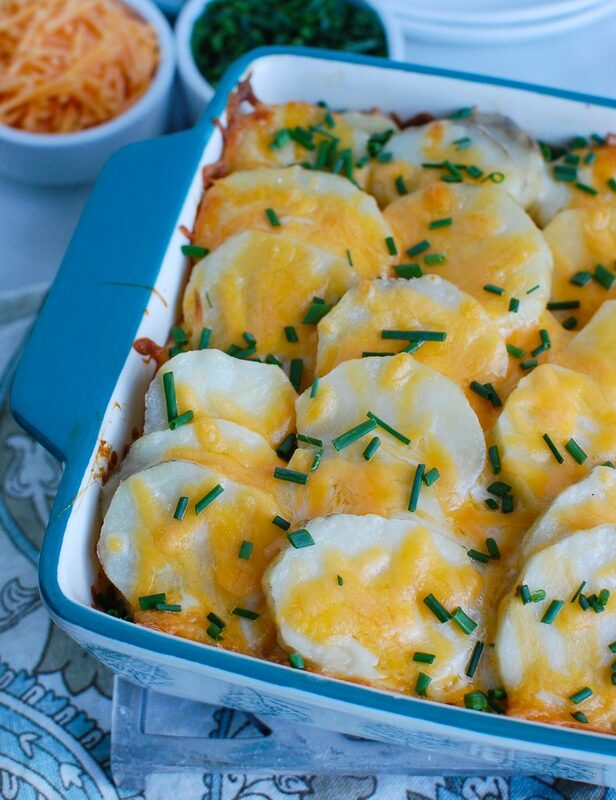 The potatoes are topped with shredded cheese and baked until warm and bubbling. 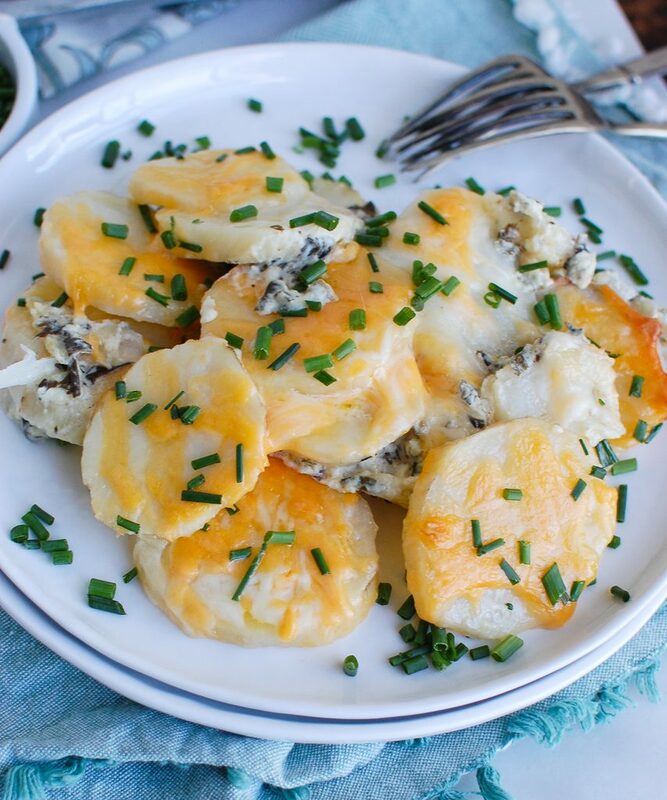 I love the flavor that the spinach artichoke dip adds to these potatoes. 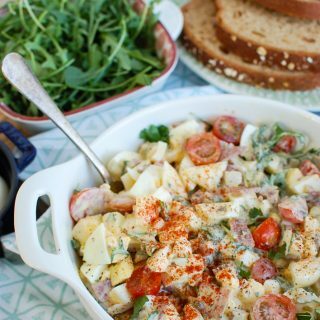 With many classic scalloped potato recipe you create a creamy sauce that is mixed in with the layers of potatoes. The nice thing with today’s recipe for scalloped potatoes is you only have to use three ingredients; sliced potatoes, a tub of the spinach artichoke & parmesan greek yogurt dip and shredded cheese. I like to garnish my finished dish with chives but it isn’t necessary. 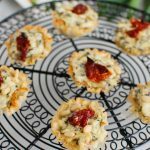 You have probably seen my recent recipes in partnership with La Terra Fina. 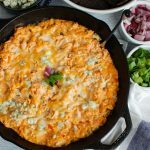 This Baked Sriracha Sweet Corn Dip and Buffalo Queso Cheese Chicken Dips are perfect for game day or an appetizer for a get together. 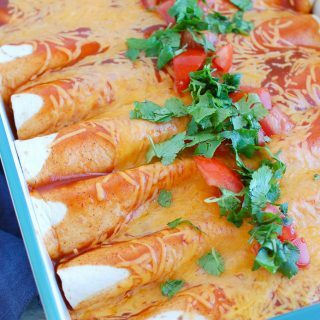 One of my favorite things about La Terra Fina dips is how versatile they are. 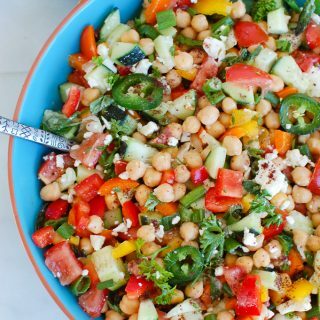 You can eat them out of the tub cold or warm along with pita chips or cut up veggies. They are also great for adding into pastas, side dishes and so much more. If you haven’t heard of La Terra Fina before, let me fill you in on this wonderful San Fransisco Bay area company. 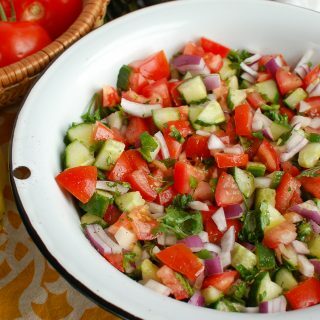 It started in 1983 by a popular caterer known for her delicious quiches and dips. 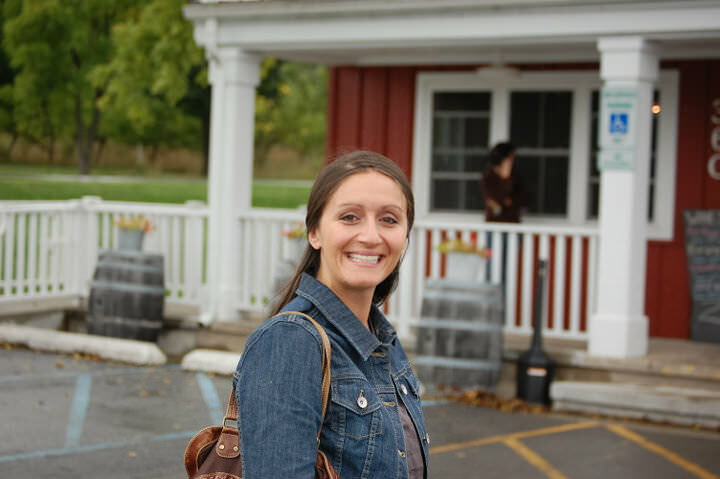 She launched La Terra Fina so everyone around the country could enjoy her wonderful foods. La Terra Fina believes that when you’re surrounded by good friends sharing stories, laughs, memories, and of course, good food, you’ve got the recipe for a great time. That’s why they have been using quality ingredients to make food you’ll want to share. Because if we’ve learned anything in the kitchen, it’s that good food is at the center of every great get-together. 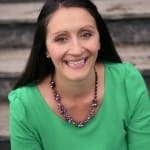 I believe that food really is the center of connecting people together, so their mission really resonates with me. As you plan out your Thanksgiving and holiday menus this year, be sure to add these cheesy, flavorful scalloped potatoes. These are always a crowd pleaser with both the children and adults and come together very easily! Preheat oven to 350 degree F and grease a 13" x 9" baking dish with non-stick cooking spray. Bring a large pot of water to a boil. Scrub potatoes and place the whole potato into the boiling water. Cook for about 20 minutes. Remove from the water and let sit until cool enough to handle. Gently peel potatoes and slice into 1/8 inch rounds. Place 1/3 of the sliced potatoes overlapping in a single layer in the bottom of the baking pan and lightly season with salt and pepper. Spoon half of the tub of spinach artichoke dip over the top of the potatoes and spread evenly. Repeat another layer of the potatoes and spread other layer of the dip over the potatoes. Finish with a final layer of potatoes. Top with shredded cheese. Bake for 20-25 minutes, or until the cheese is bubbling. Garnish fresh chives and parsley. Serve warm. You can use whatever shredded cheese you like. I really enjoy cheddar, mozzarella or even gouda. Today’s post is sponsored by La Terra Fina. As always, opinions are 100% my own. Thanks for supporting the brands that make A Cedar Spoon possible. What a great, easy way to add flavor to scalloped potatoes! Thanks!! It really is such an easy and fun way to add flavor. These are GENIUS! 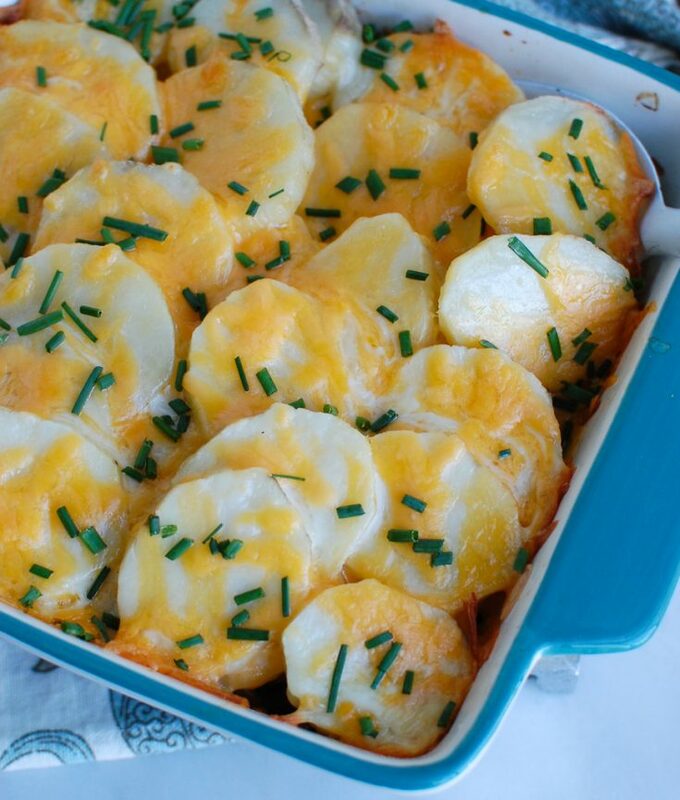 Love me some scalloped potatoes so I can’t wait to try! Thanks! Hope you enjoy them. I love the spinach artichoke flavor added in. 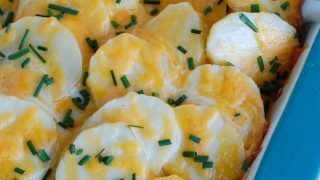 What an awesome way to add easy, creamy flavor to scalloped potatoes! It is! I am making them again for Thanksgiving! 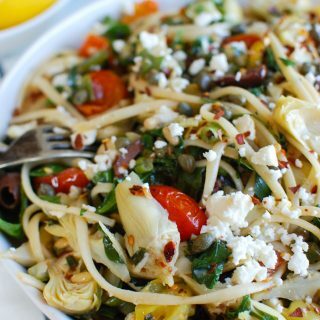 Such a SMART way to add flavor! And who doesn’t love spinach artichoke dip!? It sure is! It is an easy way to add in that flavor. 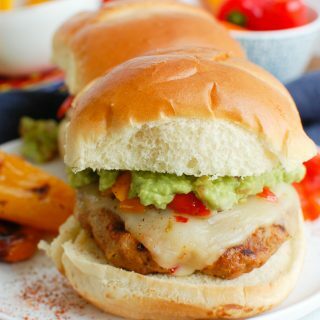 Such a quick and easy way to add extra flavor to a classic!